I made this Grilled Salmon with Pineapple Jalapeño Salsa last weekend and I’m still thinking about how FANTASTIC it was. This is another one of those need to use up something recipes. I bought a pineapple for garnishing some Mai Tai-tinis and after using it for that I wasn’t sure what I was going to do with what was left. I also had a salmon fillet I took out of the freezer to grill, but then we ended up going out to dinner and never cooked it. So it was one of those days where I had to “use it or lose it”. I grilled some of the pineapple for a dessert with a rum brown sugar glaze and ice cream which was fantastic but still had half of the pineapple to eat up. So I thought I’d make a pineapple salsa to put on top of the salmon. That’s sounded yummy to me and I’ve never made it before. Now was as good of a time as any to experiment. I had a lone jalapeño in the refrigerator and some cilantro and a quarter of a red onion. I figured that was a good start. I really would have liked to add some red bell pepper or avocado to this but I didn’t have any. Oh, and black beans would be tasty in this too! I diced up the pineapple in small bits, chopped the jalapeño, cilantro and red onion. Added some diced tomatoes, lime juice, and cumin and declared it a success! Next time I’m going to try grilling the pineapple first, then dicing it up. I’m sure the grilled flavor would only enhance this salsa. I also think this salsa would be awesome with some chips, but, unfortunately, I didn’t have any of that either. Before grilling the salmon, I just brushed it with a bit of oil and seasoned it with salt and pepper and tossed it on the grill. Then I topped the salmon with the salsa we dug in. OMG…Sooooo good! You really should give this a try. Heat grill to low heat, about 250 degrees. Coat salmon fillet with a bit of oil and sprinkle with salt and fresh ground black pepper. Grill salmon on low heat until cooked, about 10 minutes (5 minutes on each side). Combine all salsa ingredients and bowl. This can be done earlier and stored in refrigerator. 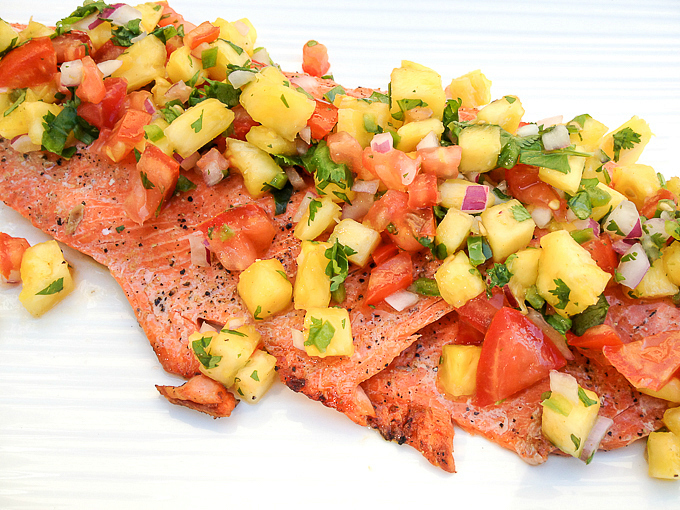 Place grilled salmon on platter and top with pineapple jalapeno salsa (you won't need all of the salsa). It was so good. I want more!